Small wind systems usually make electricity that is used in the home, farm, or ranch. Therefore, it may help to understand how electricity is consumed (or used). First, let’s explore the terms power and energy. Electricity is used each time you turn on an electrical device. Most devices measure power in “watts.” Usually, power refers to an instantaneous measure, where energy refers to power produced over time. A “watt” is a term for power and a “watt-hour” is a term for energy. A light bulb with a 100-watt power rating will use the energy of 100-watthours if it is turned on for one hour. A kilowatt is 1,000 watts. In most homes, electricity comes from an electrical utility. The amount of energy used by a customer of the utility is tracked on an electrical meter (also called a kilowatt-hour meter). It records the energy (kilowatt hours) used during a billing period and the customer is billed for that amount. In 2008, the average kilowatt hours consumed by homes in Montana was 843 kilowatt hours per month (887 in Wyoming), or 10,116 kilowatt hours in the year (10,644 in Wyoming). In small wind systems, the turbine may be described by its power, or kilowatts, but the actual energy generation is measured in kilowatt-hours. In small wind, the terms power and energy often are used interchangeably. What is a “Small” Wind Turbine? There is no common definition of “small” wind. Grid-connected home systems are typically three to 10 kilowatts. “Small” is usually defined by the electric utility. Most utilities limit the size of wind turbine that they will allow to “net meter.” In Montana, most utilities define small wind as less than 50 kilowatts rated power, while in Wyoming state law specifies systems less than 25 kilowatts rated power. Check with your electric utility to find out how “small wind” is defined in your area. A small wind system that is connected to a home or business but not to an electric utility is called an “off-grid” system. Off-grid systems are common when it is very expensive to connect to the electric utility, often due to a remote location. Off-grid systems are more complex because of the system design and require batteries to store energy. Off-grid systems require consideration of total electrical usage of the home, battery systems, and alternative (back-up) generation. Consult with a qualified system designer when evaluating an off-grid system. Most small wind turbines are designed to use “net metering.” Net metering is offered by utilities so people can connect their wind turbines to the electric utility. (In some states, net metering and interconnecting your generator to the utility are managed as two separate processes.) Many homeowners opt to remain connected to the utility because the small wind generator may not supply all of the electrical energy for the home. Remaining connected to the utility allows the home to have electricity supplied from the utility that supplements production from the wind turbine. The amount of energy used is tracked on a special electrical meter. When the wind turbine produces more electricity than the home or business is consuming, the meter spins backward. At the end of a billing period, the customer pays the “net” amount to the utility. The “net” is the difference between the amount of utility energy used and the amount of small wind energy produced. Net metering is for off-setting energy use. It is not meant to generate income, only to credit you for the energy you produce. Myth: I will get paid for any excess electrical generation. Reality: Many Western states do not pay for excess production. Check with your utility for your local rules. As examples, in Montana, any excess production is donated to the electric utility. In Wyoming, excess production is purchased by the utility at the end of the calendar year. Standards and the amount paid vary by utility. Myth: One turbine will off-set all electrical consumption on my property. Reality: This is only true if all electrical consumption is tied to one meter (one turbine per meter). As an example, a rural farm that has a meter for the home, one for the shop, and three others for irrigation water would have to either consolidate all of the meters into one meter, or install multiple wind turbines to off-set their entire consumption. Myth: I will run my electrical system seasonally (in the summer), and then use a whole year of wind energy to credit that account for a smaller total utility bill. Reality: This will depend on the billing period used by your utility. The most common scenario for this to occur is in irrigation systems. The irrigation system operates in the summer, but the best wind generation occurs throughout the year. In an annual adjustment period, the total amount of wind generation for the year can be used to offset the irrigation electricity. Most utilities in Montana and Wyoming allow the generation in a year to offset consumption in that year. Check with your utility and find out their rules before buying any wind turbine equipment. Myth: I can use my existing kilowatt hour meter. Reality: Most meters will have to be converted for a net metering application. Some utilities will provide this meter; others will ask you to pick up the expense. Ask your utility. Myth: If the power from the utility goes out, I will still have power from my wind turbine. Reality: This is only true if you also have a battery storage system. Otherwise, when the power from the utility goes out, so does the power from your wind system. Grid-connected systems disconnect during a power outage to protect utility workers from having power coursing through the electrical wires when they are repairing the utility system. The first step in buying a small wind system is to determine your electrical usage. Contact your local utility and ask for a 12-month electrical usage history (in kilowatt-hours) for your home. Some utilities provide this history online or in your monthly statements. You will also need to find the cost per kilowatt hour. 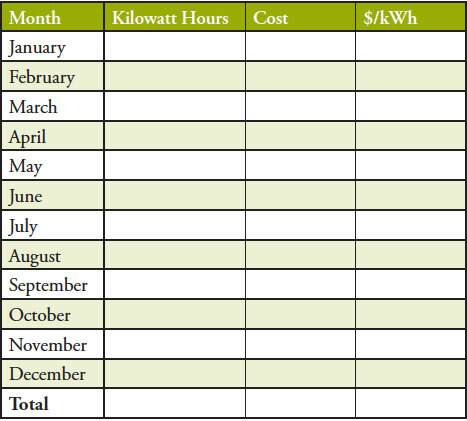 When you have your energy information for one year, fill out the table below to calculate the number of kilowatt hours used and the average cost per kilowatt-hour for the 12-month period. The local utility can provide estimates based on energy usage for similar homes in the area if you are planning new construction or an off-grid system. Remember: Make sure that energy efficiency measures have been taken before adding renewable energy systems! Not all charges can be off-set with a small wind system. Some utilities have a base-charge that is assessed to all customers. There may be system demand charges for high seasonal or monthly power usage. Demand charges may not be off-set with a small wind system. Ask your utility to explain which charges might be off-set before purchasing a small wind system. When calculating your average cost per kilowatt hour, you will need to pay attention to how much of the total cost is the actual cost of electricity (which you can off-set) and how much of the cost is base fees, demand charges, and other fees that cannot be off-set. If, for example, your total cost per kilowatt hour were $0.10, but 50 percent of that cost were comprised of fees that cannot be offset, you would only be offsetting costs of $0.05 per kilowatt-hour. The cost of electricity is a significant consideration in conducting economic analysis. Does your utility allow you to consolidate meters if you have more than one meter? Some utilities only allow one wind turbine per meter. Look for seasonal “swings” in usage. This is very important if your bill settlement or “true up” period is monthly. Talk to your utility about future electricity costs. Some utilities are very sensitive to price increases. Others have long term contracts and know their energy costs many years into the future. Cost of energy can be a significant factor when looking at the economic value of a small wind system.